We can’t name a time when Winnebago hasn’t impressed with their lineup. With their durable construction and stylish good looks, Winnebago hits the mark everytime — and the Minnie Winnie is no exception. Ideal for group travel, the Winnebago Class C Minnie Winnie is available in a choice of five different floorplans. From the 22R which offers a practical layout in a more compact size, to the 31H with its rear queen sized bed and bunkhouse, the Winnebago Minnie Winnie Motorhome is a versatile offering with all the comforts of home. Furnished in a choice of leatherette and vinyl fabrics, the interior space of the Winnebago Minnie Winnie is durable and easy to maintain. Available in a range of stylish decor options, this is an interior space made for enjoyment, without getting caught up in maintenance. Laid out with precision and loaded with key features like Smart Storage furniture, the Minnie Winnie is a functional space worthy to be a part of your travel memories. 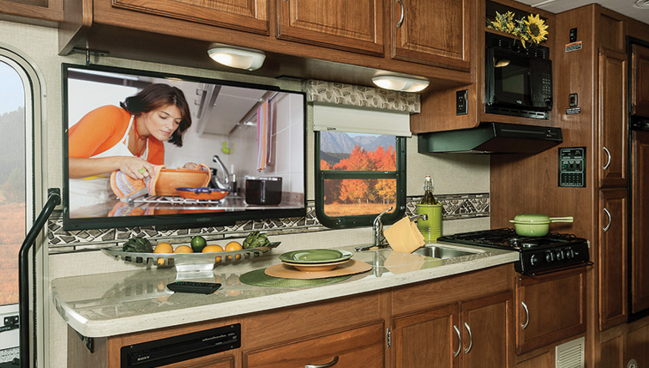 Whether you enjoy hosting guests while RVing, or like to keep it simple while traveling, the Winnebago Minnie Winnie kitchen has all the equipped to keep you satisfied. Outfitted with a three-burner range, microwave oven, and durable Corian countertops, this is a kitchen space ready with all your cooking needs. 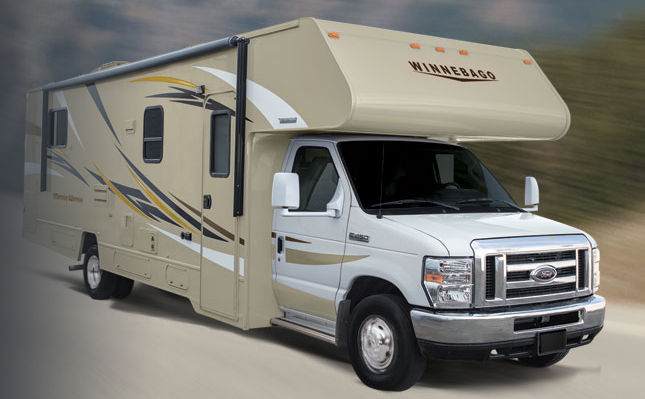 Spacious and practical, just like the rest of this impressive Class C.
Engineered with precision, the Winnebago Minnie Winnie is constructed on a Ford chassis and powered by a Triton engine. Built with Winnebago Industries’ exclusive SuperStructure body, this is a coach that affords travelers the durability and peace of mind to travel longer. Superior strength, unbeatable performance and timeless decor, all backed by the legendary Winnebago name…this is what sets the Minnie Winnie apart from the rest. To discover all this well-appointed Class C has to offer your travel lifestyle, visit our Duluth, MN location today!